Disclaimer: Halloween is totally a Thea thing when she hijacks the blog and dares me to watch and read all sorts of stuff that are way outside my comfort zone (I am SO NOT a horror/Halloween fan). First, it was The Evil Dead movies, which, wouldn’t you know, I ended up loving. Then, a bunch of other horror movies culminating on last year’s viewing of The Exorcist. This year, the Dare was to tackle the words and works of Edgar Allan Poe. Ana’s Halloween Marathon is now an official part of our annual Halloween celebration. Let the torture fun begins! For the most homely and (mostly) true narrative I am about to pen, I neither expect nor solicit sympathy. As Hallows Eve loomed in the horizon, the yearly tradition of the Hallows Eve Dare threatened my sanity. “Heavens! What untold torture could my smuggling friend devise for me this year” I thought to myself, in dreadful contemplation. Little did I know or neither could I have expected that the subject of torture was to be brought forth by your own narrator: myself! Oh, had I known, perhaps the forthcoming events could have been prevented! But alas, it was not meant to be. And finally Black Cat (watch that short film too) and The Cask of Amontillado!!!!!! 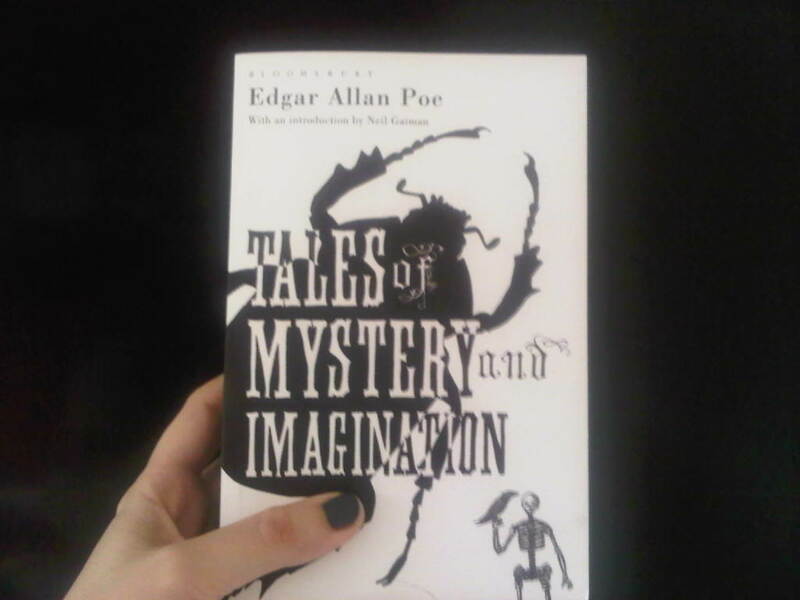 Poe’s stories are freely available online but I found myself compelled to purchase the edition above – such a beautiful packaging it had! And a foreword by that esteemed poet Neil Gaiman! Firstly I read The Tell-Tale Heart, followed by the Poem The Raven. The stories The Black Cat, Morella followed suit and The Cask of Amontillado closed this Hallows Eve task, completed at last. But friends! You might think me mad! But mad I swear that I am not. I did not fear these works nor did I complete this task with the relief of having completed a herculean labour but rather, I was embraced by that satisfied feeling that resembles that of having consumed a wonderful meal or drinking a bottle of prime vintage wine. That unparalleled feeling of having had an excellent time with a wonderful book for I truly came to love these stories. If you still think me mad for describing the experience of reading horror stories as “wonderful” please consider not only the contribution of this author to Genre fiction (Gothic! Horror! Science Fiction and detective stories) but also the aplomb with which he writes these very stories. It seems at first that some of them feature supernatural elements but rather, it is the possibility of supernatural elements that appear so clearly because often times it is implied that the supernatural is merely but a reflection of the inner struggle of diseased minds. Was the Raven truly speaking to and haunting the narrator of that story or was that narrator haunted by his own memories? Was the Black Cat a witches’ cat or the ghost of self-retaliation? Was the Tell-Tale Heart truly beating or was it the reflected beating of a mad, guilt-ridden mind? I fear that with only but this small sample, I can never fully grasp this beloved author’s works but it seems those stories I read share some similar themes – those horrible acts perpetrated by their narrators are compelled by the most humane feelings: hatred, vengeance, guilt, jealously. Yes, they are horror stories because they are all stories of death, darkness and of madness and the most terrible aspects of humanity, therefore they are not stories that will be appreciated by all .And against my own will for I prefer stories of lightness, I was thoroughly impressed by these tales. Egads! What trickery is this? These films – they are allegedly adaptations of Poe’s work but no! They are so different! The have altered the story in fundamental ways effectively ruining them for me. The two tales of terror I watched – “Morella” and “The Black Cat” did accomplish a more effusive reaction from me especially “The Black Cat” which was in truth, an amalgam of two stories: The Black Cat and The Cask of Amontillado and the closer to the original stories than the other two films. Friends, I loved the stories deeply and hold them dear to my beating heart but it is with this very same heart of mine full of regret that I disclose my discontentment with the films. To me they provided little to no horror and as “adaptations” I feel they lacked the psychological aspect that made this narrator fascinated by the stories. Perhaps, if I had approached the movies as works on their own; perhaps if I had looked upon them with more charity and sympathy and not with the full weight of great expectations this experience could have been different? We will never know for this story is now told and my tale is hereby closed. And here endeth this year’s marathon and I hope to see you again next year. I shall depart for now but before I leave this narrative, I pose a final question to you, faithful reader. If you managed to stay till this point and read through the musings of this talentless imitator, perhaps you could shed light on this topic. Did this author have an obsession with walling people up? I dare say you should still venture to seek out Corman’s version of “The mask of the red death” (which includes “Hop-Frog” in part) – it’s a very free “adaptation”, but I like the end they tacked on to the story. 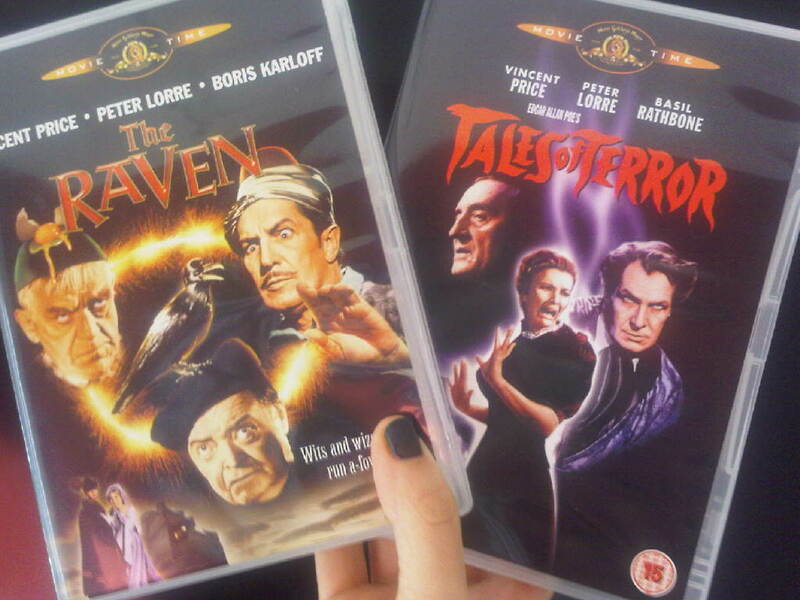 And if all else fails, it has at least Vincent Price who’s always a pleasure. I’ll admit, I’ve completely avoided Poe, at all costs. But I had very creeptastic lit teacher in high school and I still remember the day he read us The Cask of Amontillado. Unfair, I know, but that teacher gave me the willies something fierce, and now I associate that feeling with Poe. @ Megan no h : I really loved the Cask of Amontillado, that was so so ultra creepy because we never learn what brought the narrator to do what he did and I was like, TELL ME WHY POE.